2 bedrooms, 2 full bathrooms, sleep 6, master bedroom overlooking ocean! 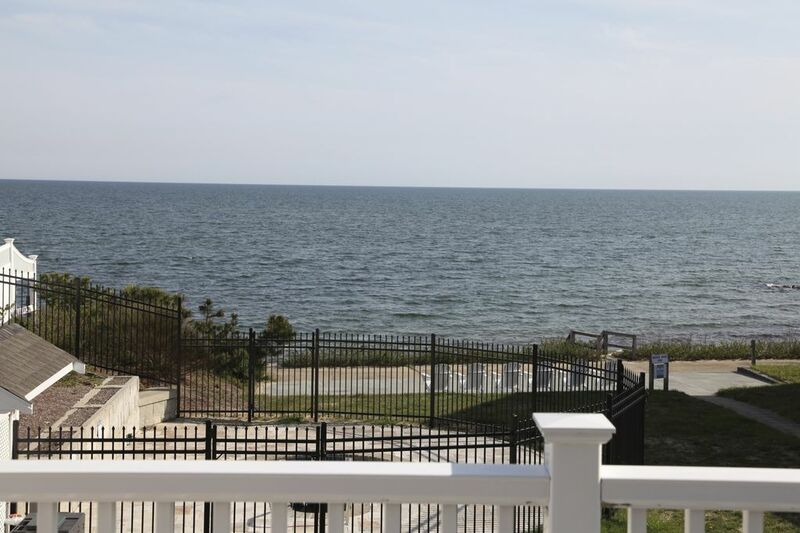 A condo brand new in 2013 with spectacular ocean view and private ocean beach on Nantucket Sound! You wake up to the sound of the ocean wave and gorgeous view every morning! Just steps away from the private ocean beach! Master bedroom and kitchen facing ocean directly! Large sliding glass doors opening to large balcony with spectacular view of Nantucket sound. Master bedroom and guest bedroom each has its own bathroom. Kitchen with eat-in area, granite counter top, and stainless steel appliances overlooking ocean view. Living room with gas fireplace and flat screen TV. Gleaming hardwood floors. Washer and Dryer inside own unit. End unit on the second floor. New condo with spectacular ocean view and fabulous ocean beach. End unit on the second floor facing ocean directly. Perfect location and space for us ! Winter walks on the beach - not crowded! Nice gas fireplace - close to off season bars and dining ! Would recommend!! Cozy beachfront condo with a great view. There was construction I wasn’t aware about but luckily they didn’t work on the weekend. Modernized condo with all the essentials. Very clean. Walking distance to one of the best restaurants in town. Would definitely come back again if staying in the area. I am glad that you enjoyed your stay and thank you for your review. The building 2 construction you mentioned is done and on the market. Please let contact me if you need additional information. Do not hesitate to book this listing! Absolutely shows exactly as pictured & Yipling was very responsive.Condo was clean & cozy...especially enjoyed the fireplace after cool days off season. Just to note beach is small but extremely private . Loved the property! Clean, updated and great location!! Beautiful view, we fell asleep listening to ocean waves every night. Best condo in the unit!! Everything you need for a wonderful get away! Refundable Damage Deposit: $200 Please contact owner for payment instructions: 617-416-8883 or oceanbeach405@gmail.com Cancellation Policy: When you decide to cancel, let us know as soon as possible. We will unblock your dates and make them available for booking. If your dates are taken (fully or partially) by others, you will get full or partial refund. Note: The rates are subject to change until rental agreement is signed.